I always find that the last few weeks of term are packed to the brim with activities. It’s like the school suddenly realises that they had planned to do a number of things during the term and for some reason, they all end up in the last three weeks. Even trying to catch up with friends can be tricky as everyone has so much on. And when life gets this busy, I find myself turning to safe, delicious, quick and easy pasta dishes. I love pasta and I really miss having a good Italian restaurant close by, although that’s probably a good thing for my budget and hips. This is one of those dishes that came together well and is great for using up leftover roast or deli chicken, or the few minutes it takes to defrost a couple of thighs or breasts won’t add much to the preparation time. I find chicken thighs far tastier than breasts. It is a darker meat and often cheaper to buy too. Pumpkin can also be swapped out for Butternut if you prefer, but as I had pumpkin on hand, it worked a treat. Butternut is sweeter, but I find the pumpkin combines well with the saltiness of the Feta and the sweetness of the cream. My family always give this one the thumbs up! Cook the pasta as per the packet directions and drain. Fry the onion over a gentle heat in the oil until the onion is translucent. Add the chicken and brown evenly. Add the garlic and pumpkin and fry for a further 2 minutes. Pour in the white wine and cream. Bring to the boil and then reduce the heat to a gentle simmer. 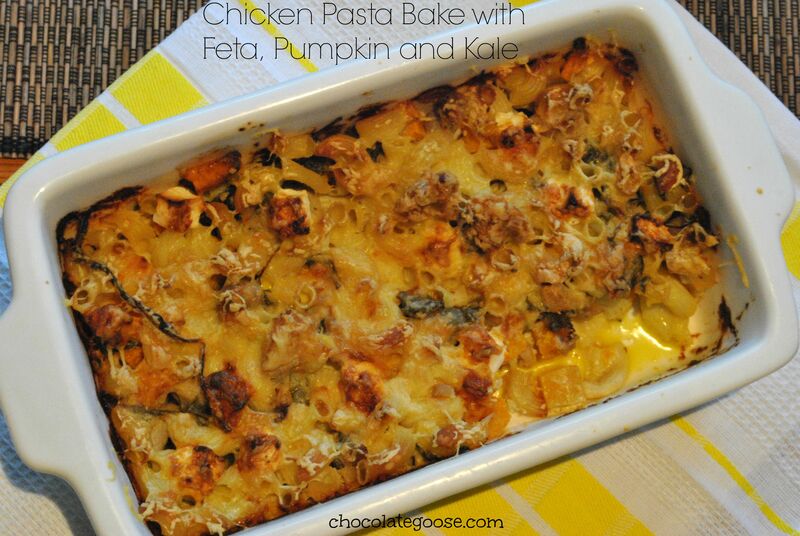 Leave to cook until the pumpkin softens and the chicken is cooked through – about 5-10 minutes. Check it as you don’t want the pumpkin to be too soft. Add the kale towards the end of the cooking time. Remove from the heat and stir through the pasta, coating it evenly. Then pour it all into an oven proof dish. Dot with the diced feta and sprinkle over the Edam and Cheddar/Parmesan. Bake in the oven for 10 – 15 minutes until the cheese has melted and browned slightly. * Use shredded leftover cooked chicken if you prefer and add when you add the kale. ** Alcohol cooks out of wine when used in cooking, but if you prefer to leave it out, you may want to increase the cream.